Mark E. Neely, 62, rural Chanute, died Thursday evening as a result of a farm accident at the farm where his parents’ had lived and where he grew up. He was born September 24, 1956, in Chanute, to William Glen and Marjorie (Kepley) Neely. He grew up in Chanute attending Hillcrest Elementary, Royster Middle School, and Chanute High School, where he graduated in 1974. He attended Neosho County Community College and Kansas State University majoring in Animal Sciences and Industry. After college he began working at Ash Grove, where he was employed 35 years and was in the process of retiring as Materials and Shipping Supervisor. He would joke that he worked there to support his true love of farming and raising cattle. On June 5, 1982, he and Dorothy McClaskey were married at St. Michael’s Catholic Church in Girard. 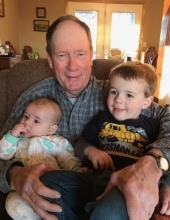 Mark believed in the importance of family and loved spending time with his wife, children, and grandchildren. He had a great sense of humor and loved to go elk hunting, raising cattle and horses and keeping up with Kansas State football and basketball. He participated in the Neosho County Fair and was active in 4-H when his children were younger. He was a member of St. Patrick Catholic Church in Chanute. Surviving is his wife, Dorothy, of the home; son, Clem Neely and wife Allison, of Paola; daughter, Glendolyn Neely, of Emporia; grandsons, Luke Neely and William Grayson Neely, of Paola; brother, Jim Neely (Colleen), of Chanute; sisters, Mary Dunn (Wayne), of Humboldt, Jane Hanson (Steve), of Jesup, IA, and Anne Sullivan (Ed), of Annandale, VA. He was preceded in death by his parents, his brother, Bob; a nephew, Bryan and a niece, Landry. Mass of Christian Burial will be at 10:30 a.m., Tuesday, at St. Patrick Catholic Church in Chanute, with Father Michael Linnebur officiating. The rosary will be prayed at 6 p.m., Monday at the church. The family will receive friends following the rosary. Burial will be at a later date at the Greenwood Cemetery. Friends may call at the Pierce-Carson-Wall Funeral Home in Erie from 9 a.m. to 4 p.m., Monday, when the casket will be moved to the church. Memorials are suggested to the St. Patrick Catholic Church in Chanute, the Neosho County 4-H Foundation or the Neosho County Fair Board. They may be left at or sent to the Pierce-Carson-Wall Funeral Home, Box 182, Erie, KS 66733. To send flowers or a remembrance gift to the family of Mark E. Neely, please visit our Tribute Store. The rosary will be prayed at 6 p.m., Monday at the church. The family will receive friends following the rosary. Mass of Christian Burial will be at 10:30 a.m., Tuesday, at St. Patrick Catholic Church in Chanute, with Father Michael Linnebur officiating. "Email Address" would like to share the life celebration of Mark E. Neely. Click on the "link" to go to share a favorite memory or leave a condolence message for the family.